Stocks slumped modestly on Wall Street, after markets in Europe were buffeted by worries that the Greek debt crisis would prove contagious and Chinese investors endured another topsy-turvy session. By early afternoon in New York, the Dow Jones industrial average was down 1.1 percent, the Standard & Poor’s 500 was down 1.4 percent, and the Nasdaq average had fallen 1.2 percent. 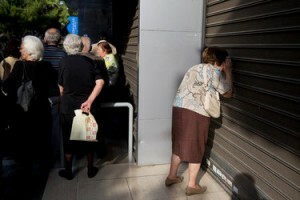 If Greece fails to make payment, Mr. Weinberg said, the country could be declared either in arrears or in default, with such a determination taking several days. If Greece is declared in default, “a clock starts for creditors to deal with it, and just the existence of that uncertainty will be a cloud over the market, because we won’t know for a while,” he said. “And when the big money starts to reposition itself, that’s when we’ll see the big moves,” he added.